Welcome to the 21st issue to subscribers of Right Writing News. If you are reading this issue forwarded from someone, be sure and use the link below to get your own free subscription. 1) What Makes A Bestseller? 6) What's Your Reader Tolerance? The question is worth asking but there are few answers. What elements have to come together to for a book to suddenly skyrocket to the top of the bestseller charts? In my last post, I talked about the importance of story—for nonfiction and fiction. Each of us need to learn how to write meaningful stories. The writing will always have to shine for it to get the buzz and attention going. Yet some wonderfully written books don’t get to the bestseller list. Several years ago, I was interviewing Jerry B. Jenkins for a story related to one of the Left Behind books. Jerry realizes the unusual way his series of books has caught public attention—with over 60 million copies in print and a huge appetite for the next book the series. Jerry recommended that I read a book from Malcolm Gladwell called The Tipping Point, How Little Things Can Make a Big Difference (Little, Brown Company, 2000). A tipping point according to Gladwell is that magical moment when an idea, trend, or social behavior crosses a threshold, tips and spreads like wildfire. What causes it? The Law of the Few is one of the critical elements where three groups intersect and come together. These three factors are: connectors, mavens, and salesmen. A connector is someone who knows lots of people and Gladwell gives a simple test. He takes about 250 surnames from the Manhattan phone book. You are to scan the names and see if you know someone with that last name. As he says on page 41, "All told, I have given the test to about 400 people. Of those, there were two dozen or so scores under 20, eight over 90, and four more over 100…Sprinkled among every walk of life, in other words, are a handful of people with a truly extraordinary knack of making friends and acquaintances. They are Connectors." A Maven is one who accumulates knowledge. "A Maven is a person who has information on lots of different products or prices or places. This person likes to initiate discussions with consumers and respond to requests." (p. 62) So you see two of the elements—mavens and connectors. "In a social epidemic, Mavens are data banks. They provide the message. Connectors are social glue: they spread it. But there is also a select group of people—Salesmen—with the skills to persuade us when we are unconvinced of what we are hearing, and they are as critical to the tipping of word-of-mouth epidemics as the other two groups." (p. 70). Do I have it figured out? Not at all. I believe Gladwell is on to something significant for these factors to come together to tip the balance and make a book move from one level to the bestseller category. I hope it provides you with a bit of my insight. I still have a great deal to learn about this particular question. W. Terry Whalin understands both sides of the editorial desk--as an editor and a writer. He worked as a magazine editor for Decision and In Other Words. His magazine articles have appeared in more than 50 publications including Writer's Digest and Christianity Today. Terry has written more than 60 nonfiction books. 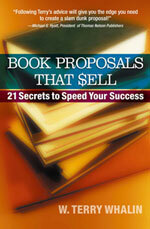 His book for writers is called Book Proposals That $ell, 21 Secrets To Speed Your Success (Write Now Publications). See more about his writing at www.right-writing.com/whalin.html. He is the Fiction Acquisitions Editor for Howard Books. Terry and his wife, Christine, live in Scottsdale, Arizona. For almost twenty years of my writing life, I've been automatically keeping track of different little bits of information. I tuck an address into my address book or I update a phone number or a new email address. It doesn't take a great deal of time but it's a consistent and conscious act on my part. I know some of the data in my rolodex is a bit dated. Yet I keep it there because I understand some times even an out-of-date address has value. Several years ago, I needed to reach an author for the publisher. Because of my role in acquisitions, the managing editor turned a project over to me. This author who has a busy counseling ministry owed the publisher a manuscript. There had been some back and forth correspondence via email to talk about the editorial details with this manuscript. When I took the background information including the book contract from my colleague, I asked, "What's a current phone number for _____?" This busy managing editor said, "I've never talked with him on the phone. We've only communicated through email." Heading back to my desk, I knew I needed to reach this author on the phone and talk through these editorial issues. Email has its purpose—but it's also a less personal means of reaching someone. It's pretty easy to turn someone down via email or reshape their request or idea. I knew on the phone and in person, the conversation would be much more ground leveling with this bestselling author. But where do I find the phone number since it wasn't in the file? About fifteen years earlier, I had worked with this author as an editor and ghostwriter on one of his books. During that brief experience, we communicated a great deal but I hadn't talked with this author in over fifteen years—yet his old information remained in my rolodex. It was a starting point. I called the old phone numbers and they didn't work. My only choice was the front door approach. I called this author's office and reached his assistant. When I explained the need, this assistant said, "You could be anyone on the phone, Terry, posing as a publisher. I can't give you that information." I tried a different tact, "Does _____ still live in (name of the city), California?" "Does he live at (specific street address)?" "Is his home phone number (specific area code and number)?" After giving this information, the assistant made a long pause on the phone. Then with a sigh, she said, "Yes, that's the phone number but the area code has change to ____." I thanked her for her "assistance." In a matter of minutes I was talking with this author's wife (another bit of information in my rolodex) and beginning to connect with him about my editorial issue. I understand the power of keeping track. In an earlier post, I wrote about the Devil In the Details. It's true you have to keep track of the details in the writing life. I love what Ellen J. List has written about the value of networking at a writer's conference—which is a valuable first step to connecting with the editor. It's important to exchange business cards every possible chance. One key from my perspective is what do you do after you get the business card? Tuck it into your desk or put it in your computer where you can easily access it? For many years, I keyed the information from my business cards into my computer rolodex. Now I use a Targus Mini Business Card Scanner. The device isn't perfect in the scans. I may still have to type a few bits of information. But overall it's a huge timesaver and helps my process of keeping track of information. I understand the power of such information—even if it's old. When you approach an editor with your column, be sure the first impression is great! Dazzle the editors by getting creative with your external package appearance. Attractive boxes, packages and envelopes, are always opened first. Make your first impression good. Write your column. Edit it. Take some time away from it, then edit it again. Let others read it and jot down their opinions. Put it away for several days and begin this process all over again. I also sent the information I got from all of the "polls" I conducted. Many people do not send in query letters because they feel it just prolongs the final result. What people really should do is to send both a query letter and a sample column, or whatever the newspaper or syndicates guidelines say to do. Market your entire package/proposal (your package/proposal is basically all of the material you are sending) in a brightly colored, large envelope as described earlier. Everyone likes to get to the attractive things first. I do not care who says this does not matter; it does. I get more than 15 packages a day. This triples in the weeks leading up to Christmas. My entire family has to help me keep an inventory of the items, products (including books) and tons of things for kids. The reason I get so much stuff is that if I plug something in my internationally syndicated column, it is worth mega free advertising bucks for these companies. They often respond by sending me samples of their product. The packages that catch my attention are the ones that stand out because of their wrapper. For example, a couple of years ago, Disney sent me a wooden crate full of toys based on the Looney Tunes gang. They made a new movie, DVD and tons of other things to try to remarket Daffy Duck, the Tasmanian Devil and some of the older characters of yesteryear. The wooden crate was full of action figures, T-shirts, caps, games, CDs, movies, and even a new Barbie. What stood out to me? It was the "dazzle" and quality of the crate. It was unique, was an unusual size, and could be used to store items, plus it contained a lot of fun stuff. It was different and got my attention! The same is likely to be true of the editors you deal with at a newspaper or syndicate. They get a lot of submissions, so make yours stand out. The stamped return envelopes that you send in with the rest of your material can be plain. It is important to make a good first impression and get your proposal opened. Another example of how creative marketing might help: Oprah once asked for different things to be sent in for a show - things people had invented or were selling that they thought were unique. At the time, I belonged to a business women’s group that had around 50 or so members. Someone came up with the idea of making large colored cubicles and gluing different items to the outside of the cubicles. The cubicles ranged in size and pattern, making the completed project quite large, probably about the same height as Oprah and almost as wide as the couch she kept on stage at that time. It turned out to be such a rare work of creative marketing that Oprah actually showed it on stage and announced the group’s name. This was quite exciting, and everyone was thrilled when she chose to show America what the business women in our division had come up with. As you can see, first impressions are important and packaging is the first impression. Jodie Lynn is an award-winning internationally syndicated family/healthcolumnist and radio personality. Her syndicated column Parent to ParentError! Hyperlink reference not valid.has been successful for over 10 years and appears in newspapers, magazines, newsletters and throughout the Internet. She is a regular contributor to several sites including eDiets.com, ClubMom.com and BabyUniverse.com. Lynn has written three books and contributed to two others, one of which was on Oprah and has appeared on NBC in a three month parenting segment. Excerpted from Syndication Secrets - What No One Will Tell You! All Rights Reserved. Used with Permission. Copyright © 2006 Jodie Lynn. Hiring a publicist could be the best thing you could do for your book. Or it could be a huge money sink with no dividends. If you’re considering hiring a publicist for your book, learn what your publicist won’t tell you. (And then check out the dozens of other articles on the http://www.PublishingGame.com web site, and sign up for the (free) Expertizing email newsletter on how to do your own publicity at http://www.PublishingGame.com/signup.htm). Fern Reiss is the author of The Publishing Game: Bestseller in 30 Days (book marketing), The Publishing Game: Find an Agent in 30 Days (finding a literary agent), The Publishing Game: Publish a Book in 30 Days (self-publishing). For more information on Publishing Game books, workshops, and consulting, and on getting your book and business featured in the national media, sign up for the complimentary PublishingGame/Expertizing email newsletter at http://www.PublishingGame.com/signup.htm. I used to be a pretty patient consumer. I would read a slow starting novel and give it at least 100 pages before I stopped. Or with nonfiction, I would faithfully plow through every single page of information and consume it. Or with a dull movie, I would sit with the video or DVD version until the last frame of the movie. Last night my wife and I rented a recently released film which we missed when it came in the theater. We watched about 45 minutes of the 125 minute film, then looked at each other and turned it off. Our reader tolerance hit the ceiling. These days I'm finding my reader tolerance level isn't very high. Maybe it comes from seeing too many poorly-crafted manuscripts on the fiction side of things—where the story is actually begins way into the manuscript. Or maybe it's from seeing too many nonfiction manuscripts that have no readers or market in mind when they were created (or seem that way from the writing). Or maybe it's the piles of books with great promise and not enough hours in our hurry up world to possibly read them. In fiction, the story situation or the character or some other fiction element has to grab me. For nonfiction, the topic has to have enough storytelling to keep me turning the pages. If not, I find that I flip ahead and some times I don't finish the book. As a positive example of a book that caught my attention in the general market. I know Jack El-Hai, the author, from my involvement with the American Society of Journalists and Authors. I was looking at Jack's website to promote the book and this paragraph jumped out at me, “As gripping as a medical thriller, The Lobotomist examines the motivations of a man whose personality combined brilliance with arrogance, compassion with egotism, and determination with stubbornness. The result is an unforgettable portrait of a physician who permanently shaped the lives of his patients, as well as the course of medical history.” It looks fascinating to me. With reader tolerance, here's a few tips for the writer to keep in mind: show don't tell, begin with a bang, and write in the active tense. Each of these articles in the links have detail information for these tips. You may think you handle all of these elements with excellence—but I'd encourage you to return to your manuscript and make sure it's present. Reader tolerance is a subjective matter. Your reader tolerance will be different than my reader tolerance. As I write or edit, it's an important element to keep in mind. I've learned that many people ask this question before they are ready for an agent. These authors want to have their books published but have learned almost nothing about the business or how to craft an idea for the market. One of the best things you can do for yourself to find an agent (or a publisher) is to get published in magazines. The experience of writing for magazines is invaluable and will help your writing career--and help an agent be interested in your work. No matter where you are in your writing career, whether you are advanced or beginning, it's difficult to find an agent. Having a connection with that agent is critical. One of the key factors is whether the agent charges you for the services or whether he gets his income from selling your book manuscript. If the latter, then it's more likely they are a solid agent. If they are charging you to market your book, then I'd be suspicious because they could be making their money from simply charging you (and many other would-be authors). Have you ever seen the ads for literary agents in writing magazines who charge reading fees? If you wonder if people prey on unpublished authors, then you need to read Jim Fisher's book, Ten Percent of Nothing, The Case of the Literary Agent from Hell (Southern Illinois University Press, June 2004). Fisher is a former FBI agent and this book reads like a fascinating novel. You will learn about a frustrated science fiction novelist, Dorothy Deering, who was burned by two fee-charging literary agents who did nothing to locate a publisher for her work. As an ex-con, Dorothy saw the money-making potential in starting her own fee-based agency. She believed there were thousands of writers who had stars in their eyes about publishing and who couldn't get the attention of traditional publishers. These writers would be willing to pay money to have their work marketed to publishers. This simple concept of fee-based reading and marketing of manuscripts began one of the biggest publishing scams in American history. Thousands of would-be writers paid millions of dollars to Deering, a former bookkeeper who had no professional experience as a writer, editor, agent or publisher. Fiisher who worked for the FBI for over twenty years, was drawn to this story after learning of a friend who lost money in this scam. The author exposes an ugly side of American publishing and the book emphasizes the warning signs to any would-be writer so they will not be drawn into such practices. I recommend anyone in publishing get a copy of Ten Percent of Nothing, The Case of the Literary Agent from Hell to help their own education about the importance of using common sense and also avoiding fee-based agents. You will learn from Jim Fisher that Dorothy Deering ran a publishing hoax. She never sold a single manuscript to a major publisher and bilked millions of dollars from her clients that were spent on personal cruises and expensive cars and homes. Dorothy Deering went to prison for her scam but others have taken up this confidence game within publishing and writers need to know about this little talked about aspect of publishing. I work with a number of terrific agents--as an editor and as a writer. It's interesting to me the depth we go to when we check out a good car dealership--yet how we don't do our homework sometimes with an agent. I understand part of it--as writers, we want anyone who wants our work--but that might not be the wisest route. Anyone can suddenly become an agent and that agent might not be the right one for you. I've got some great basic information about this topic on Right-Writing.com including: The Safest Way to Search for An Agent and Do Literary Agents look for new authors? These two articles will give you a start in the journey to locate an agent. I hope it helps. Many writers look upon negotiating as an unpleasant, stressful chore to be avoided at all costs. And, because they're uncomfortable with negotiating and the confrontation and risk taking it entails, these writers frequently get the short end in bargaining sessions. Success in negotiations can increase your salary; get you a better position, gather support for your project or department; gain approval for a budget; and Improve your chance for success on the Job. Therefore, it pays to overcome your aversion to haggling and to improve your negotiating skills. You can gain immediate improvement simply by following the suggestions presented below. When most of us think of negotiating, we assume one of two things will happen: either we'll win or we will lose. But the pros don't look at it that way. They know that a successful negotiation is one in which both sides feel like winners...at least to some degree. When you sit down to bargain, don't feel you have to win on every issue. Score major victories, but concede small points. Ask yourself, "What can I give up that will please the other person without putting a major dent in what I want out of this?" Many corporate workers like to think t at certain company policies and procedures are unchangeable, as commandments etched in stone. The fact is, nothing is unchangeable and everything is negotiable. Knowing this fact is a powerful advantage in bargaining. For example, a consultant, negotiating his fee with a client, was told that the company could not go along with his request for partial payment in advance. "I don't see anything wrong with it but my hands are tied," explained the project manager. "Company policy doesn't allow payment until at least part of the work is completed." The consultant knew better than to accept this at face value. "Bill," he replied, "I appreciate that that may be the way you normally deal with suppliers. But as an independent consultant, I receive payment up front from people who want to hire me. I know that this policy is just a guideline set by management and management can break it if it wants to. And I am telling you that you have to break it if you want me to take on this project for you." A week later, the consultant received a purchase order and a check for one-third of his fee. • The maximum--the highest figure. The most you dare ask for without fear of "blowing away" your Opponent. • The minimum--the bottom line. The lowest figure you'd settle for. • The goal--a realistic figure you have a good chance of getting. The goal is probably between 50 and 75 percent of the maximum. It pays to be optimistic and aim high when setting your maximum. For example, a scientist requesting funds to purchase a new piece of laboratory equipment might be able to buy an adequate machine for between $15,000 and $50,000. If he proposes $50,000, and management cuts his budget in half he ends up with a $25,000 machine. But by setting his initial request 20 percent higher, at $60,000, a cut In half would leave him with $30,000--and a machine with $5,000 more in capabilities and performance. When negotiating, try for your goal but be prepared to accept any offer between the minimum and the maximum. In some cases you may be surprised to find that the maximum is approved without argument. At other times, your opponent may not even grant you the minimum. If this happens, you may be forced to consider more drastic action such as going to your opponent's supervisor, threatening to quit, or changing jobs. The person who controls the negotiation is usually the one who has set the guidelines. Make sure this person is you--and not your opponent. To do this, say, "Before we get started, I'd like to go over the situation as it stands, and outline what we hope to accomplish here." Then go on to state things as you see them. The other person will generally agree, interjecting only to make a few minor modifications to what is basically your point of view Thus, when you begin to negotiate, you're in control of the situation--because you defined it. To succeed in a negotiation, you must be prepared physically, mentally and psychically. To throw you off guard, the other person may try to force you into a surprise negotiation. A boss, for example, sticks his head in the door and makes a request to which he wants an immediate answer. Or, the phone rings. and a customer suddenly wants an on-the-spot price quotation on a project you and he discussed in vague terms months ago. Don't be bullied into a negotiation You're not prepared for. Say to the boss, "Gee, I'm in the middle of a rush job. Why don't I drop by your office later this afternoon." Say to the customer, "I'm with someone right now, and it will take me some time to put the figures together. I will call you back tomorrow." No reasonable person would deny these requests, and you will gain time to prepare your case. You'll also enjoy the advantage that comes from holding the negotiation at a time and place of your choosing. The best way to prepare for a negotiation is to gather all the facts, statistics, precedents, case histories, documents and other evidence supporting your position. Printed evidence is especially potent. People are skeptical of oral arguments, but they assume that words printed in an article, book or report are true. Collect surveys, studies and article clippings, make copies, and highlight or underline key facts to make them leap off the page. Unleash this powerful support when you fee! you are losing ground on a key point. You may end up using only a small percentage of this material, but you'll negotiate with greater confidence knowing it is available. Experience proves that people who succeed in debates and negotiations are usually the ones who have the most facts. Writers and other people who think logically are eager to achieve what psychologists call closure." Closure is a neat, final, well-defined solution to a problem. Technical people seek closure because they are trained to find precise solutions. But life isn't an equation; negotiations and other "people problems" can't always be wrapped up as neatly as a mathematical proof or engineering design. When negotiating, you should expect and be willing to accept at least some ambiguity in what is resolved. If 90 percent of the issue is settled, and people in the meeting are beginning to grow restless, let the other 10 percent go for a while. Don't insist that every last detail be buttoned down that day; otherwise, you risk angering people and losing the ground you've gained. On the other hand, don't start giving in to your opponent just because you're tired and cranky and ready to go home. Instead, call for a break. Sum up where you are so far, and suggest wrapping it up in a future session...when, thanks to a few days rest and contemplation, everyone will be able to approach the situation with fresh Ideas--and fresh minds. Above all, remember that you're dealing with human beings, not machines or chemicals. You'll have an edge if you learn as much as you can about your opponents before you sit down to negotiate. Be aware of the personalities involved and adjust your "sales pitch" accordingly. Top executives, for example, usually want to get to the bottom line in a hurry. They are concerned with the "big picture" and don't want to waste time with minutia. The poet Henry Wadsworth Longfellow once said, "If we could read the secret history of our enemies, we should find in each man's life sorrow and suffering enough to disarm all hostility." You may dislike your opponent or be angry at him for blocking your way, but your negotiations with him should be civil and friendly not argumentative and hostile. Keep your cool when attacked, and respond with sound arguments and supporting facts. not an outburst of temper or shouting. Try to highlight, whenever possible, the common goals and points of agreement between you. After all, this isn't war, it's a negotiation. The two of you have, for the most part, similar goals; it's your ideas on how to achieve these goals that differ. When responding, use phrases that show your empathy with the other person's position, such as "That's a good point" or "I agree with most of that, but . . ." Make the other person feel like a winner and both of you will be. Beginning a novel is easy. You can start with a bang, introduce colorful characters, set up intrigue, and generally gun the story engine like teenager in his first car. It's that long middle section that's a challenge. Sometimes your plot engine starts to sputter and spit as it rolls through Act 2. It may even stall. Instead of words flowing out of your tapping fingers, your hands freeze over the keyboard as you stare at the screen. You don't know how to answer the question What happens next? Some simple repairs may be in order. Do you have a protagonist with an objective? Arresting characters can only carry a book so far. Unless they are actively, passionately trying to get (or get away from) something, you'll soon run into plot stall. Further, the objective must be absolutely crucial to the protagonist's well-being. If it isn't, why should the readers care about what happens? Suppose you have a lawyer whose objective is to leave his law firm and start his own practice. That has implications for his professional life but is not, by itself, enough to sustain novel-length interest. But what if the law firm is a mafia front and leaving is not permitted (unless it's in a pine box)? Then you definitely have the protagonist's well-being at stake, and a plot that moves--as does John Grisham's The Firm. Watch out for the decision objective, because it is usually weak. This is when a character decides to do something, maybe out of interest or curiosity. Yes, he moves toward a goal, but only because he's decided to do so; he could very well have decided not to. The best objectives are thrust on the characters. In Star Wars, Luke Skywalker could have decided to leave his planet and go off to become a Jedi. Weak. But when his aunt and uncle are killed by Empire minions, he has a strong reason to leave and join the rebellion. Sheriff Brody in Jaws does not simply decide to take a fishing trip. He goes after the shark because it will kill more of the people in his town, and the mayor has decided to keep the beaches open. The hunt for the shark is a forced decision. Next, look at the opposition character. Is he as strong (or preferably stronger) than your protagonist? Is he three dimensional? Have you given him a complex background so he's not just the personification of evil? All opposition characters believe what they are doing is justified. Create this justification, and even some empathy, for your opposition. Attractive villains are more dangerous than the old-fashioned moustache twirlers. In The Silence of the Lambs, Hannibal Lecter's charms nearly outweigh his, ahem, appetites. He is an unforgettable--and scarier--character as a result. The good news is, character solutions are easy once you identify what's gone wrong. "What's the good word these days, Tina?" Rhonda asked. "Oh, a little of this, a little of that." Tina smiled and raised her water glass. "I know, same old, same old. How's Bill?" "Bill's just fine. A good man." "Yes, I guess I am." "Oh, a little of this, a little of that." Tina gritted her teeth into a smile. She raised her water glass, holding it too tightly. Relax, she told herself. Don’t let her know Bill walked out. Tina took a deep breath and fought to keep from trembling. "Bill's just fine. A good man." "What is that supposed to mean?" Tina took a sip of water. "I'm just asking. Are you all right?" "Of course I'm all right. What is this, psych 101?" Rhonda looked away, shaking her head. Introspection, a character reflecting on his plight, is good in small doses. But if the character's thoughts run on too long -- and a good rule of thumb is that 200 words is getting too long -- the reader may start to lose interest. Where had he put it? If he didn't find the keys, he was cooked. But he was always cooked, it seemed. Life had handed him plenty of slaps. He was used to it. So what if he lashed out at others? Why should he suffer alone? He lifted the sofa cushions. The keys weren't there, either. Finally, if a character is not taking steps toward her objective, it is a sign that she is not passionate enough about the stakes. In her book Getting Into Character (Wiley), Brandilyn Collins counsels coloring the passions of the characters. This deepening will generate layers of emotion that propel the character forward. To begin coloring a character's passion, identify her deepest desire. Name it. Then explore all the emotional aspects surrounding that desire. The desire for revenge, for example, can include anger, shock, resentment, embarrassment, shame. Delve into each of these and the reasons they attach to the character. Push them to their limits and analyze your character anew. Now look at the opposite of the main desire. For revenge, you might take a look at compassion, mercy, love. These will give you the seeds of a character's inner conflict. And a character with doubts is a lot more engaging than one who has everything all figured out. Now it is left to you to illustrate, in dramatic fashion, the character's multi-faceted emotional struggles. You have a deep well of passion to draw from. Driving a novel to the last page involves frequent stops, refueling, and some work under the hood. Use these techniques to keep rolling toward a satisfying end. James Scott Bell is an award-winning novelist and writer conference speaker. His latest novels are the legal thriller Sins of the Fathers (Zondervan) and the historical epic Glimpses of Paradise (Bethany House). He's also the author of Write Great Fiction: Plot & Structure (Writers Digest Books). Visit his website: www.jamesscottbell.com. © 2006 James Scott Bell. All Rights Reserved. Used with Permission. The complaint: "Editors practice age discrimination. I'm over 50 and editors believe only young authors can write for children." The truth: Editors are interested in finding good books, period. It doesn't matter how old the author is. Take a look at the lists of award winners (ask your librarian, or do an Internet search for Caldecott or Newbery Awards) and note the ages of the authors. Many didn't start writing until their kids were in school full time, or took up writing as a second career. Editors also know that the best stories come from years of life experience, and older writers have more to draw from. Yes, occasionally a book written by a teenager will make the news, but more often than not it's the novelty of the author's age that gets the publicity, not the quality of the writing. And why does the editor know your age in the first place? There's no reason to mention it in your cover or query letter, unless it has direct bearing on the story. If you're writing historical fiction and you actually lived through the events in the plot, or your nonfiction book is based on years of study in the subject, then your age is a plus. The complaint: "I'm a man, and editors think only women can write children's books." The truth: Sorry guys, but this one's a little ridiculous. Again, look at that list of award winners. Men are well-represented. Glance through the names of editors in Children's Writer's & Illustrator's Market published by Writer's Digest Books. Lots of men there too. The only time your gender might be an issue is with the readers themselves. For example, teenage boys might not buy a science fiction/adventure story written by a woman, or middle grade girls may think a man can't possibly pen a series featuring four adolescent girls at summer camp. They're wrong, but you can always use your first initial instead of your name to fool your audience. The complaint: "They're just wrong about my writing! All editors want these days are famous names, not quality books." The truth: Yes, many editors (especially those at larger houses) have to be concerned with making money for the publisher, and so rely on a certain number of established authors each year to pay the bills. But they also know they need to find new writers, because those standbys aren't going to be writing forever. Sometimes it's almost impossible to interpret a rejection letter, and one or two form rejections does not mean you're a failure. Editors are people too, with personal tastes and the need to balance each list by subject matter and age group. However, several rejections in a row deserve a closer look. Are you submitting to appropriate publishers, who actually publish the kind of book you've written? Have any of the houses on your list recently published a book very similar to yours? Is your manuscript riddled with typos or grammatical errors? Even though a copy editor will fix these before the book's published, sloppy presentation can give an editor reason to reject a manuscript when she's got 50 others sitting on her desk waiting for her attention. In most cases, though, it's the writing that gets the manuscript rejected. And since it's the editor's job to recognize good writing and help those authors make their books even better, there is a chance (admit it!) that the rejection is deserved. How can you tell? First of all, if you get personal comments about your manuscript in the rejection letter, take those to heart. Play devil's advocate and assume the editor's right, and see if those changes improve the work. Secondly, get objective input. Join a writer's group, get a professional manuscript critique, or pay for a personal critique session at a writer's conference (most Society of Children's Book Writers & Illustrators workshops--www.scbwi.org--have optional one-on-one critiques). Take writing classes, read books on writing. Do whatever you can to learn how to judge your work and make it better. The complaint: "Publishers aren't interested in publishing books that will help kids." The truth: Whoa! If children's book publishers didn't produce books that benefit kids, they'd go out of business in a heartbeat. Of course, we can all walk into a book store and find books that aren't worth the paper they're printed on, but that's true of any product. (Have you ever bought a T-shirt that disintegrated in the first wash, or a DVD player that self-destructed in a week?) I'm not saying that's a good thing, but our society seems to tolerate a certain amount of drivel in the marketplace. However, all publishers prefer commercially-appealing books that also have substance. This complaint consistently comes from writers whose goal is to "help kids," or teach them how to grow into solid, caring citizens through their books. This is admirable and even desirable, but very often the message is heavy-handed and preachy. The message smothers the story, and the book ends up sounded like a lecture. It's simply not good writing. Try reading several popular books wit h a message embedded in the plot (ask a teacher or librarian for recommendations) and work on the writing-improvement suggestions above. The complaint: "I'm disabled/poor/have had a hard life and want to share my story, but no one will listen." The truth: I imagine it's difficult for an editor to reject a manuscript that comes from someone who has struggled with adversity and is still determined to follow their lifelong dream of becoming a published author. The tough circumstances themselves don't work against the writer (very often they contribute to powerful stories) but an author's unique situation cannot outweigh less-than-stellar writing. What's on the page is what matters the most. If your story is too personal (it's about your life as an adult, or you haven't extracted the universal feelings and crafted them into a story that will be relevant to a wide audience), the book simply won't sell in the children's market. Again, learn what makes a quality children's book and get objective feedback on your manuscript. Remember, no one owes you a publishing credit just because you took the time to write a book. Writing is hard work, and requires self-education, practice, and persistence. There's no shame in p utting aside a manuscript that simply won't sell and writing something new. Every published author has a drawer full of those, and enough rejection letters to wallpaper an office. So join the club– it's worth the price of membership. Copyright 2006, Children's Book Insider, LLC.